Yay! You finally read it. I’m glad it measured up. I love how Patrick Ness can make you sympathize with the bad guys every time. Oh, you will like Monsters of Men, but you’re right in guessing that you’re sort of dropped right in the middle of the action again, so you better be ready for that before you open it. Hopefully in a month or two? ;) Can’t wait to hear your thoughts. Hmmmm…. One year?! I couldn’t wait that long! Chaos Walking is my 2nd favorite YA trilogy! (My favorite would still have to be Phillip Pullman’s His Dark Materials.) I can’t imagine myself taking a year to get to the 2nd book, and you think you have a copy! But yes, I agree with you that Ness’s work tends to take a toll on you emotionally, but I love him for it! Hehehehe. My favorite in the series is the 3rd book, Monsters of Men. It’s so satisfying and heartbreaking. It was one of my best reads for 2010. I never really predicted where The Ask and the Answer would take me. By separating Todd and Viola and letting them experience different challenges, Patrick Ness gave his readers so much food for thought as well. I remember staying up all night just to finish this one — the action and the drama were really intense. I started reading this on the plane back from Florida and all of the feelings and emotions from reading TKoNLG came flooding back to me. I read two chapters, and had to put it down. I don’t know, I think it was too much, and I wasn’t prepared to read it in a spot where I didn’t have the ability to read it all in one sitting, I suppose. I didn’t feel like I should be reading it in a cramped spot on a plane. I wanted to be at home, in bed, on my couch, or some comfortable place where I could cry, yell, or throw the book. I think I read most of this book at home, especially because I tend to gasp and suddenly close the book whenever something happens there. 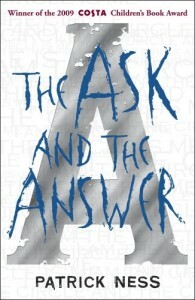 I think Patrick Ness books requires a break from reading it every now so the reader can regroup emotionally and such.